We enjoy greens of every description, and are lucky enough to have wide variety of fresh, organic greens available at our local Farmer’s Market every Saturday. It is always difficult trying to decide which greens I will buy each week and I constantly find that I buy too many, filling up my refrigerator with bags full of fresh greens. I use my greens in soups and stews, as well as sautéed, sometimes alone, while other times I mix the greens with other vegetables. One of our favorite is kale, and our local market carries a number of different varieties of kale. I generally always pick up a bunch of Lacinato, or Tuscan Kale, as I love it’s tender texture and almost sweet flavor. Compared to other varieties of kale, it is more delicate in flavor and works well in everything from raw in salads or cooked in soups. I often sauté our green just with sliced garlic and red chili peppers, sometimes I add tomatoes, sometimes white beans, and sometimes both beans and tomatoes. This week I pulled a can of garbanzo beans from the pantry, and added them to the kale after I sautéed it with diced onions, pancetta, and chili peppers. Along with it’s other members of the Brassica family, kale and cabbage provide an excellent source of vitamins A, C, Carotenoids, along with a decent amount of fiber, iron, and calcium. The amount of vitamin K, important for blood clotting, in kale is far superior to that found in broccoli, spinach, and Swiss chard. 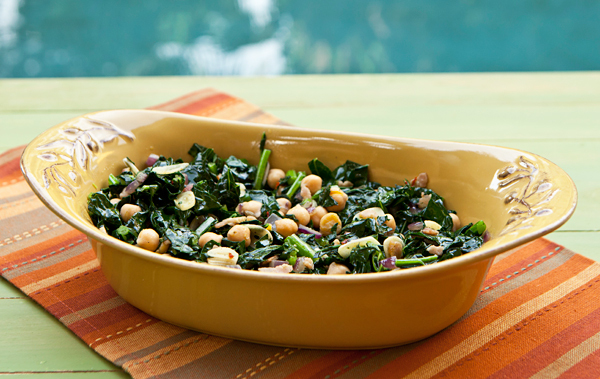 Cannellini and garbanzo beans rock as they are packed with fiber, protein, folate & hard-working phytonutrients. Greens prepared in this rustic manner are delicious served with grilled or roasted meats. In a large pot, heat the oil and cook the onions and pancetta until the onions are translucent, and the pancetta is beginning to brown. Add the garlic and chili pepper, and cook for another minute or two. Add the kale and stir well to coat with the oil mixture. Cook over medium low heat, stirring often, until the kale is tender, about 12 to 15 minutes. Season with salt and pepper, and add the beans, and cook until the beans are heated through, about 5 minutes.